This one turned out to be not so well, but hey, its very long ago that i made an azdharchid. Well, here it is: Phosphatodraco, did you ever heard of a Pterosaur with such a cool name! ?Phosphatodraco, that sounds really cool. His name means phosphate dragon. 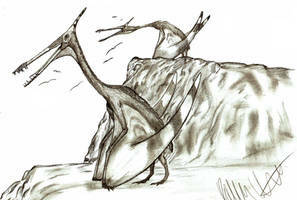 He ws a medium sized azdharchid witha wingspan of 5 metres. Azdharchids were a group of late evolving pterosaurs that grew to enormous suzes like quetzalcoatlus and hatzegopteryx which were the biggest flying animals ever took to the air. They had long necks, big heads and big wings. 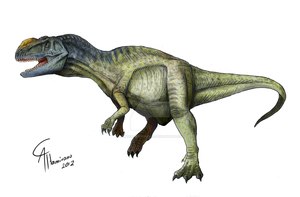 First life reconstruction ever of Phosphatodraco. head is hypothetical as it wasnt found yet.